03 Jan What is a Differential Pressure Gauge? Differential pressure gauges are one of three different types of pressure sensors. Rather than measuring strictly system pressure or vacuum, these gauges measures the difference between two pressures. Differential pressures gauges are not always well understood and are under utilized. Knowing how they work and incorporating them can be very beneficial in terms of time and money. They can protect your valuable equipment, improve your processes and minimize errors in a simple, cost effective and reliable way. They are a perfect solution for industries such as refining, power generation, chemical and petrochemical, oil & gas, water, metals, mining, wastewater and others. They are a great solution for applications such as monitoring filtration, ­­­­­­­­­­­­­­­­­­­­­­­­monitoring liquid levels and flow. A differential pressure gauge measures the difference in pressure between two connections. Imagine an application where you have one tank at 100 psi and another at 95 psi. If you connect a differential pressure gauge between those two tanks, you will read 5 psi which is the difference between the two – needed information on one dial. Without a differential pressure gauge you’d need 2 gauges – one for each tank and you’d have to keep calculating the difference between the 2 gauge readings. This allows greater room for error and equipment damage. One of the most common uses of a differential pressure gauge is for filtration. When you’re using a common (not using differential pressure gauges – and not accurate) way to monitor filtration you run the risk of knowing when to change filters too late. This results in expensive down time at the least, higher maintenance costs and even possible damage to the system by contamination that has been passing through unfiltered at worse. Instead of waiting for something to go wrong and incur possible damage installing a differential pressure gauge will keep it from getting that far. Using a single pressure gauge won’t give you a clear indication when it’s time to replace or backwash a filter. And with lack of accuracy the error could be doubled. So if you’re looking for 2% accuracy – it could actually be closer to 4%. Using the one DP gauge accuracy will only be tied to one and not 2 gauges. Often operators aren’t trained to utilize the 2 pressure gauges on a filter. They also don’t understand the need to do the math to get the differential pressure between the two or why that even matters. 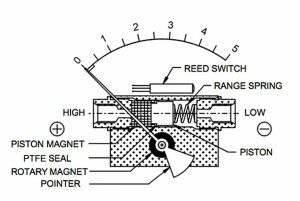 Of some of the gauge designs to achieve this, Differential Pressure Plus utilizes a design known as a “Magnetic Coupling.” Each gauge has a magnetic piston that moves back and forth like a sea-saw depending on the differential pressure. 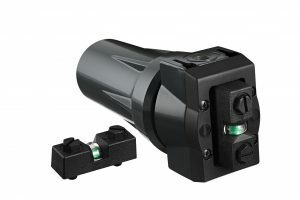 As a result, the linear movement of this magnetic piston pushes and pulls on a rotary magnet that connects to the pointer. This “magnetic rack and pinion” provide the readout. Another application for a differential pressure gauge is an alert to leaks in containers, tanks, valves and other such equipment. Pressure decay is a common way to detect leaks. Differential pressure gauges are highly sensitive, give fast results and work well in this application.